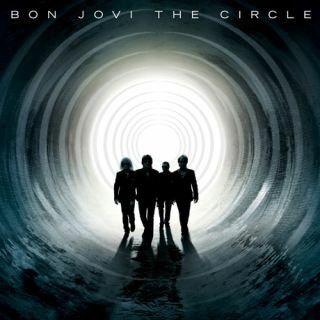 Judging by some early notices, you'd think that on The Circle, Bon Jovi's 11th studio album, the Jersey boys have committed some unpardonable sin along the lines of Sonic Youth employing standard tunings or Trent Reznor getting all La Vida Loca on Dancing With The Stars. By attacking the populist band for writing (gasp!) anthems custom-built for stadiums and, yes, beer commercials, one wonders if some of these self-professed pundits have actually listened to a Bon Jovi record before. What were they expecting? Fugazi? My Bloody Valentine? Sorry, folks, but Bon Jovi have always been at their best when cranking out and cranking up big-time rockers with titles and lyrics geared for the blue-collar masses. True, Jon Bon Jovi might never have spent time absorbing the works of John Ford, Woody Guthrie and John Steinbeck as that other Garden State institutuon, Bruce Springsteen, but since the day he first sang about Tommy working on the docks and poor Gina dreaming of running away, you believed his ever word. On The Circle, the band, again paired with producer and co-writer John Shanks, have ditched all traces of their wildly successful forays into country-pop and create the kind of fist-pumping, chest-beating earnest rock - think variations on Glory Days and Downbound Train and you have a good idea of what we're talking about here - that made them stars 23 years ago. Oh, and one other thing: With rare exception, each song is instantly memorable, working its way into the thicket of your senses. Don't try to fight it - you'll be humming these tunes in your car whether you're playing the CD or not. Like that's such a bad thing? Please. A driving, minor-key rocker that wastes little time getting to the "Yeah! Yeah!" pre-chorus which yields to a full chorus that va-rooms the pedal to the metal. Richie Sambora's brief guitar solo screams out. Four minutes and three seconds never went by so fast. A delicately plucked acoustic arpeggio transitions into a thumping, gorgeous anthem. Surging electric guitars build in intensity, and Sambora's solo is melodic and soaring. A song about lost dreams and those yet to be discovered, one that hits its marks with poignancy and assurance. True, Springsteen and to a lesser extent Billy Joel (on Allentown) have covered similar ground, but when Jon asks - no, beseeches - "Who's gonna work for the working man?" he's asking the right question at the right time. Sambora weaves sinewy, bluesy licks throughout. And the last chorus? Fuggedabout it - it explodes. Jon Bon Jovi has long sported a Superman tattoo on his arm, and now he's written a heart-tugger to back up what many perceived to be an act of supreme hubris. "Who's gonna hold you when you turn out the lights?/ I won't lie, I wish that I could be your Superman tonight," he sings unironically. Sambora turns in a solo that is by turns stinging and soothing. Grungy guitars and electronic percussion kickstart this tough little number. "What is the distance between a bullet and a gun/ God are you listening or have you just given up?" Jon ponders. Raw, gritty guitar jabs dart in and out and then, after a minor-key bridge, Sambora lets loose with an impassioned wah-wah solo. Killer. A breakneck rocker in which Jon asks what happens to dreams that fade away. "But I'll survive!" he insists, and you buy it. A humdinger of a guitar solo is the highlight here, and Sambora piles on '80s-era hammer-ons that don't sound incongruous, if only because he's obviously having a blast. In less capable hands, this piano-based ballad about the pains of growing up would turn into unbearable schmaltz, but because Jon's aim is so true, his message is so clear, the song nails you in the head and heart. Sambora sprinkles spiraling riffs throughout, building to a guitar-and-orchestra collaboration that is remarkably potent. Keyboard atmospherics gain steam over a number of musical progressions, underpinned by Sambora's thick guitar lines. He pulls out the stops on a solo that ends before it truly gets going. It would have been nice to hear him stretch out more here. So far, the album's weak spot. Echoey, Edge-like guitar lines yield to a chorus that sweeps you away - in fact, the entire track is one big chorus (how's that for songwriting flair?). A wicked, double-tracked solo by Sambora, brimming with pinch harmonics, stands out. Melodrama built around Sambora's top-string lines that crashes into an arms-waving-in-the-air chorus of "Sha-la-sha-las." Sure, it's gimmicky, but it works like a mofo. A trifle that feels like a full meal. A minimalist guitar line informs the musical bed of this confessional rocker in which Jon sings, "I'm down on my knees/ I've learned how to plead/ I'm turning my world around." Once again, Sambora dispatches a sizzling solo but pulls back much too fast. More guitar, Richie! Floor toms, acoustic guitars and piano make up much of this album closer, more of a dreamscape than a fleshed-out song. Sambora's background vocals lend ample support, but it's his ringing, stirring guitars at the end that bring this baby home.